Mae's Food Blog: Hope for Michigan? Michigan is in terrible trouble. Maybe the President will help the auto companies, but even with a bailout, the future here looks pretty grim. The icy pavement and wintery clouds we've been having seem to reflect the revenge that Michigan business and labor are suffering at the hands of the neo-Hooverites in the Senate recently. 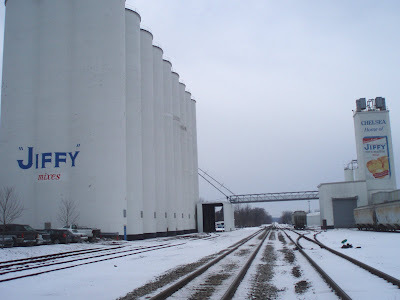 Here's a little ray of hope: the Jiffy Mix plant, which has been in business longer than the auto industry, is still sending little blue boxes of cornbread mix, muffin mix, and many other products out to all 50 states and to military stores abroad. 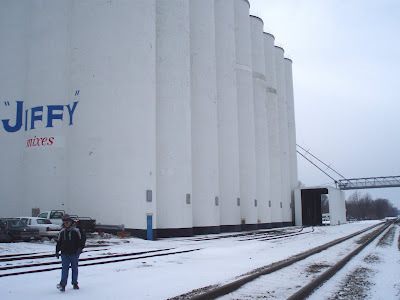 The grain elevators and the processing and packaging are all located in Chelsea, just down the road from here. Mabel White Holmes ... developed and introduced to the homemaker the first prepared baking mix product, “JIFFY” Baking Mix, in the spring of 1930. Currently we offer 21 “JIFFY” Mixes. Our mixes provide you, our consumer, with the best value available. Chelsea Milling Company is a complete manufacturer. We store wheat. We mill wheat into flour. We use that flour for our own mixes. We make our own “little blue” boxes. We do it all-that’s why our mixes provide you with the best possible value. The town of Chelsea is a fun place to go. You can look at the Jiffy plant, and within a block, shop at little galleries and gift shops and dine well at The Common Grill restaurant. The town is also know for the Purple Rose Theater, which puts on live performances. Everything is close together for a really appealing small-town atmosphere. If only they all or mostly can stay in business through these tough times. 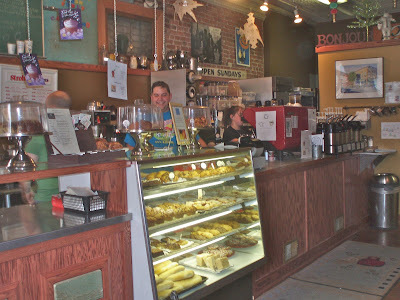 ZouZou's cafe, a block from Jiffy, has delicious home made baked goods, sandwiches, and espresso. This afternoon, after taking these Jiffy photos, we had a nice cappuccino and a brioche. Like Jiffy, ZouZou's has a sense of history. Among their ice cream concoctions are the Detroit Specialties -- a peppermint sundae using a recipe from the dining room on the 13th floor of the long-demolished downtown Hudson's department store and a hot fudge cream puff using the recipe from the old Sanders' Candy Company ice cream parlors. I hope General Motors isn't really on course to join Hudsons and Sanders in the nostalgic annals of defunct Michigan businesses. There are still Sanders shops in a few places - there's one in Grosse Pointe that a friend took me to for my birthday last summer. I miss Hudsons. I love ZouZou's. And Jiffy, of course. And I believe every child in a 50 mile radius has probably done the tour. (And gotten the sampling of free mixes). That's definitely a tour I'd take on my next visit to Michigan! Lydia, let me know when you are in MI and I'll give you a tour! Just gathering some info and links for a future Jiffy post. Thanks for the info. I'll be saving this link for sure. Is this a Bacon Fad?